"I'm going to tell you every time I mess up!" Jeff Tweedy proclaimed after his third song of the night and that truly set the tone for remainder of the show. For just around two hours the Wilco frontman stood alone onstage with just an acoustic guitar strapped around him and tore into hits from across his lengthy career. "How you doing tonight? That's the first thing you learn in frontman school. I'm still working on it." 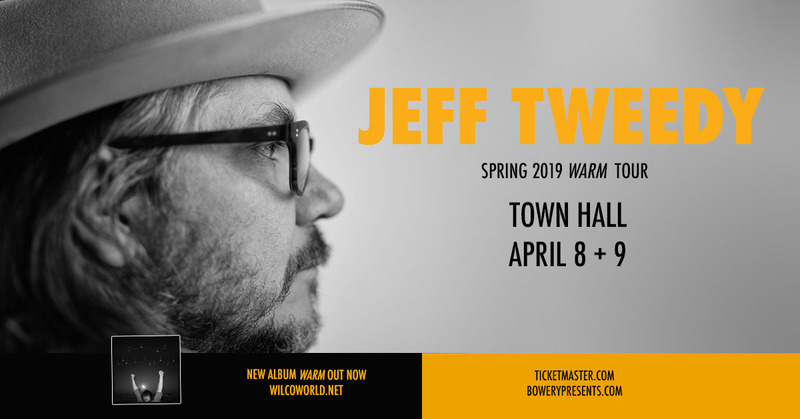 Tweedy was in a conversational mood for the evening and let his banter run free between each harrowing number, eventually giving in to the joke at one point and saying that there would actually be more singing than talking by the end of the night. Musically, it was striking to see such a naked performance. The acoustic nature of his solo record blended perfectly with the acoustic renditions of some of his band's most famous work. "I am Trying to Break Your Heart" received rapturous applause when the acoustic breakdown replaced the well-known electric freak-out and slightly rattled Tweedy. "I messed up when you cheered. I just played the guitar. Haven't you heard the record? Is the bar for me really that low?" Laughter echoed throughout the hall and lighthearted moments punctured the more moving moments of his songs. "Hummingbirds," "Jesus, Etc.," and "Passenger Side" were all triumphant in their stripped down glory and displayed the songs' brilliance in all new ways. Tweedy let it all on the line and took it all in stride. Usually backed with his legendary band, his vulnerability in this setting is incredibly apparent, but he strikes with sincere conviction. Cheers rang out for the opening notes of "You and I" before he blurted out "oh it's your wedding song, isn't it? It's all of your wedding songs." He was in on the jokes and gave in to the crowd at just the right moments while still keeping himself at a distance. "Ashes of American Flags" was another fantastic moment and as he introduced "Let's Go Rain," he encouraged the entire crowd to singalong after joking all the night how the crowd excitement and participation was causing him to mess up. "It's just a guy and an acoustic guitar, you're in comfy seats, and it's a Monday night. You're not gonna rock out too much. I'm sorry." Just as the night came to a close, the crowd began to play along with Tweedy's remarks a little too much and a few people heckled him before the rest of the crowd fell silent. "What the hell happened? This went from pretty ok to weird." The night closed out with a sharpened version of "Misunderstood" which all too perfectly saw Tweedy close out the night shouting "I'd like to thank you all for nothing / I'd like to thank you all for nothing at all!" 08 "Ashes of American Flags"
10 "I'm the Man Who Loves You"
15 "I Am Trying to Break Your Heart"